There has long been concern here about who owns and controls land, with decisions being made and benefits accruing to people outside the area. The idea that the local community should have some influence and control is very attractive to many of us, whether through land purchase by the community or by some form of partnership working. 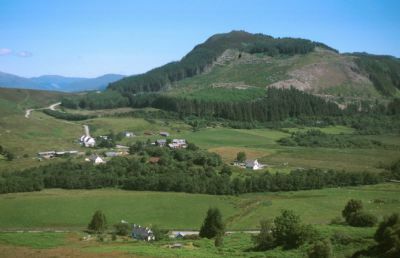 Achmore is largely a “forestry village”, with eight houses built by FC in 1950, and most residents, until very recently having some connection with the Forestry Commission. Around 30 people collected their wages from the Achmore office in the 1960’s, but by the 1990’s this was reduced to one employee in the community. However, there was a feeling among some of us that the forest could provide more local benefit with a different approach, and when we heard about developments at Laggan in 1996 where they were negotiating forest purchase by the community, we thought it worth exploring. The Trust was set up in 1998. It is a company limited by guarantee (No 188633), with charitable status (Scottish Charity no 033722). It is owned by the membership. The Trust now owns 110 acres of land, purchased in February 2001, which has been used to create small holdings and allotments. We also own the old forest office in Achmore. The field, shed and fank at Achmore bridge is not owned by the Trust, but we have a written agreement allowing community use. 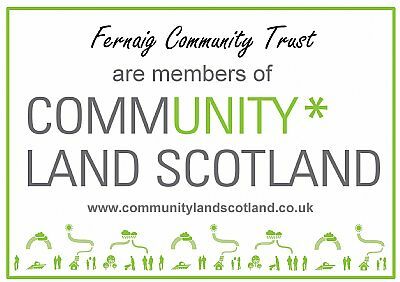 Membership is open to any adult resident in the Stromeferry and Achmore Community Council area. Craig was added to this by special resolution. The annual membership fee is £1. Life membership £10. People outside the area can be non-voting (associate) members. The directors meet on the second Tuesday of every month. The AGM was held in December 2015. The maximum number of directors is 9, but more can be co-opted. At each AGM half of the directors stand down by rotation, but may stand for re-election. We have a Concordat (partnership agreement) with Forestry Commission, under which all management decisions in South Strome Forest are made jointly between the Trust and FC. It was signed in 2000. Under the Concordat decisions concerning South Strome Forest are taken by the Management Group, which meets quarterly, with a quorum of 2 from Fernaig Trust and 2 from the Forestry Commission. The Concordat was revised in 2006.